Charter schools have been promoted as an equitable and innovative solution to the problems plaguing urban schools. Advocates claim that charter schools benefit working-class students of color by offering them access to a "portfolio" of school choices. In Charter Schools, Race, and Urban Space, Kristen Buras presents a very different account. Her case study of New Orleans—where veteran teachers were fired en masse and the nation's first all-charter school district was developed—shows that such reform is less about the needs of racially oppressed communities and more about the production of an urban space economy in which white entrepreneurs capitalize on black children and neighborhoods. 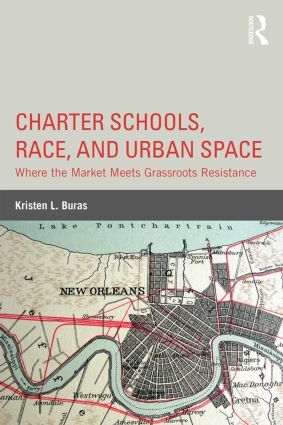 In this revealing book, Buras draws on critical theories of race, political economy, and space, as well as a decade of research on the ground to expose the criminal dispossession of black teachers and students who have contributed to New Orleans' culture and history. Mapping federal, state, and local policy networks, she shows how the city's landscape has been reshaped by a strategic venture to privatize public education. She likewise chronicles grassroots efforts to defend historic schools and neighborhoods against this assault, revealing a commitment to equity and place and articulating a vision of change that is sure to inspire heated debate among communities nationwide. New Orleans—A Guide for Cities or a Warning for Communities? Kristen Buras is an Associate Professor in the Department of Educational Policy Studies at Georgia State University. She is the author of Rightist Multiculturalism and coeditor of The Subaltern Speak. She is also cofounder and director of Urban South Grassroots Research Collective for Public Education.